I had doubts actually when the shoes arrived through the post - I slipped my excited feet into it & it felt a bit narrow at the sides, I have heard about the Speedcross feeling bit narrow but didn't expect the XA Pro 3D to feel like that too - afterall I've used Shoefitr to check how it compares with my NB MT876 & it seemed it would almost be the same feel.. but the arch support felt intrusive & the fabric was too tight a wrap around my feet. But of course I also knew that new shoes need breaking into ~ I just didn't know how well the XA Pro3D would mould to my feet, and by the time I learn that it'd prob be too worn to be exchanged? So yea, doubts. For about 2 days. Gravel Dirt track. Anyway once I was in bush land, the XA Pro3D started slowly shining. The firm wrap from the heel cup, the arch & up to the toe width zones really made a difference getting stability on the track. Once again, it could be that the shoe is still new & in comparison the fabric from my old NB is already stretched. Going downhill fast was where the shoe shone brightest for me, the GRIP was outstanding & on occasions where i'd hesitate going any faster (for fear of slipping from loose pebbles) the shoe responded with assurance & never did slip once.. (I've lost shoe grip few times on the same downhill track with the old NB), also I feel once again the firm shoe fitting played a huge part in achieving this (in having very little room for slippage within the shoe). So was real happy with the performance. The occasional big sharp rocks that protruded out, I still felt pinching at the toe area but certainly not enough to trouble.. 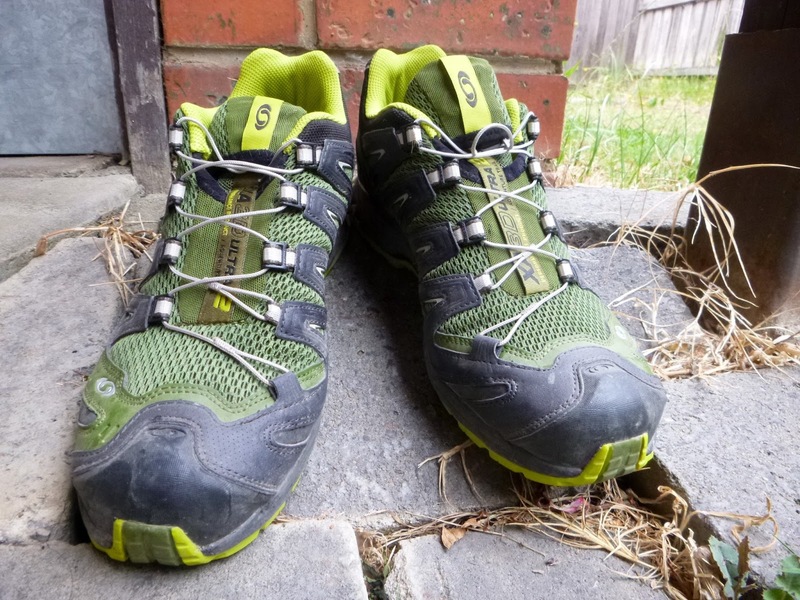 I remember wincing in pain when the NB took on sharp rocks of the Grampians as I was going downhill. I hope Salomon's advertised 'long-lasting cushioning' is a kept promise. 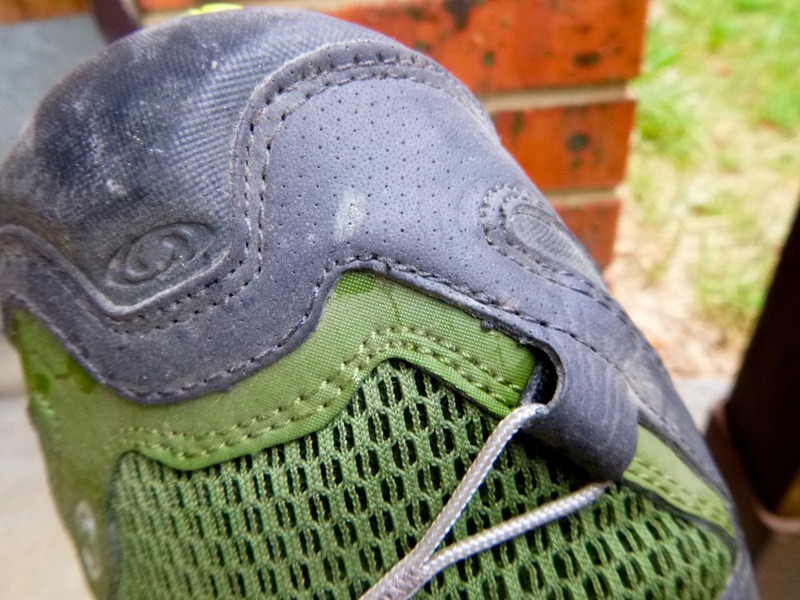 Layers of cushioning, protection + a chasis heel cup..
Toe Cap. Not fully tested in the sense I didn't deliberate go kick a rock, but that toe guard/cap does look formidable doesn't it! Wonder how long can the black fabric seen here can last tho.. probably will get abrasion & torn quite easily. Drawstring Lace System. Works a treat - semi-easy to adjust mid-way through the run, otherwise it's guaranteed to stay in place (vs. traditional lacing). And I do love the design of the lacing system. & how it slips into the pocket storage once you've tightened it down.. Comfort. I have a slightly smaller left feet. So I tightened the left shoe a bit more, a usual practice with my other shoes too. Half-way thru the run I had to loosen the drawstring as the arch area was starting to feel uncomfy.. felt better but the arch was still pushing a bit too much into the toes.. as a result, some discomfort now at the upper front arch zone (esp at side of foot). Pretty sure it's the moulding process in action, only time will tell. My right foot felt snug throughout the run & can't ask for more! However I do attribute 70% of the comfort to choice of socks - mine are thickish & wool-based to minimise abrasion on long runs.. Overall Performance? What can I say, like millions others who has bought it & given it a 5-star rating, I love it :) And very relieved that the shoes do feel much more comfy now vs 2 days ago. Sounds cornybut I actually didn't feel like taking them off after my run, but that was exactly how I felt... :D you'll fall in love with yours too & that's a guarantee. VERDICT? BUY! Especially if you get it on discount (which I did!) :D Happy trail running folks! So.. 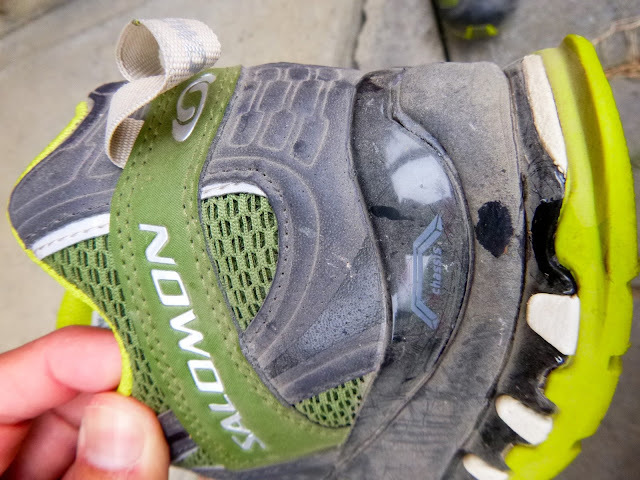 I was running back in the tropical jungles over February & found that the XA Pro 3D had trouble wicking off quickly sweat/moisture from INSIDE the shoe (coz yes you will sweat a whole lot more in the tropics, humidity/heavier rains etc). Bit like the problems you read about wrt Gortex shoes. While the top part of the shoe is made of perfectly breathable quick-dry mesh.. it's the mud-guard & toe-guard protection that stops quick drainage. 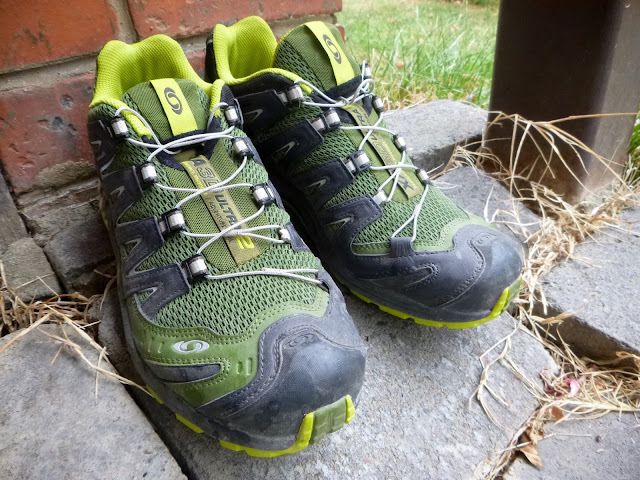 So while this is probably a common design approach to many off-trail shoes anyway, I find that my old NB MT876's design of incorporating the side-gauze (I think they call it Lightning Dry Liner) is the better shoe for very wet conditions, quick drainage etc. won't exactly stop wrinkly damp skin from forming but certainly would be far more comfortable for them toes. Just thought I share this finding. Nearly forgot to add that the Toe-Guard works :) - this time it was properly tested too, plenty of sharp rocks where I ran, the guard knocked against a few of them while I was going downhill fast & tho the toes were all snugged up right behind the guard & they did feel the knock but barely felt the impact.. ! Good stuff..
ha i know.. our timing on getting salomon shoes is so coincidental! anyway ur speedcross looks great too! i think its also more popular than the XAPro3D for sure..